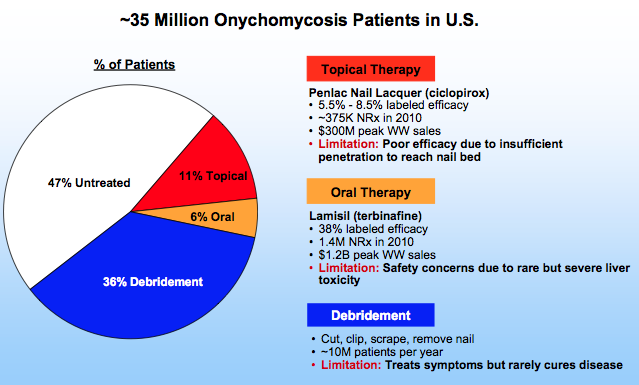 Is Anacor’s Tavaborale The Onychomycosis Cure We’ve Been Waiting For? November 8, 2013 /0 Comments/in Toenail Fungus Treatments /by Jenn F.
Anacor is one of six “under-performing biotech stocks analysts love,” according to Equities.com. The company develops small molecule therapeutics and “scored a big victory with the FDA’s recent acceptance of a New Drug Application for Tavaborale in October,” says the site. They’ve seen stock gains of 92.77% since June. Recently, a Canadian company was ordered to pay Anacor $142.5 million for trying to steal intellectual property and develop the toenail fungus treatment independently, despite contractual obligations. This makes us wonder… how juicy are these trade secrets? Could tavaborale be the onychomycosis cure we’ve been waiting for? Anacor’s tavaborale seeks to succeed where so many other toenail fungus treatments fail. Debridement is time-consuming and only marginally effective, says Anacor. Only 38% of Lamisil users saw 100% nail clarity over the course of 12 weeks and the product has been associated with liver failure to boot. Topical treatment with Penlac works for a meager 5.5 to 8.5% of the people using it because the product does not penetrate through the nail plate to reach the site of deep infection. Despite these limitations, Lamisil enjoys annual sales of $1.4 billion and Penlac boasted U.S. sales of $125 million in 2002, before generic versions became available. – Enhanced nail penetration properties makes tavaborale 250 times more effective at penetration than Penlac. – An essential fungal enzyme terminates fungal cell reproduction and growth. – There are no systemic side effects observed in any clinical trials. The FDA accepted the New Drug Application after reviewing phase III tavaborale studies in the treatment of onychomycosis. Each randomized, controlled study enrolled 600 patients with clinical distal subungual onychomycosis on 20-60% of their big toenails. Patients applied tavaborale or ciclopirox lacquer (Penlac) once a day for 48 weeks. Study 301 resulted in a complete cure for 6.5% of patients, compared to 0.5% in the ciclopirox group, for the first end point. The second end point saw cure rates of 26.1% in tavaborale users, compard to 9.3% of ciclopirox users. Study 302 saw cure rates as high as 35.9% for tavaborale users. Full FDA approval of the new drug could come as early as July 29, 2014. For people suffering from toenail fungus or the threat of a fungal nail recurrence, eight months is a long time to wait. Unfortunately, you will need to settle for Lamisil, Penlac, or laser toenail therapy in the meantime. Be sure to sanitize your footwear daily with the podiatrist-recommended SteriShoe UV shoe sanitizer and keep your feet dry. Can Ciclopirox Shampoo Help Combat Fungal Infections of the Feet? Which Types of Doctors Treat Toenail Fungus, Warts and Other Foot Problems?